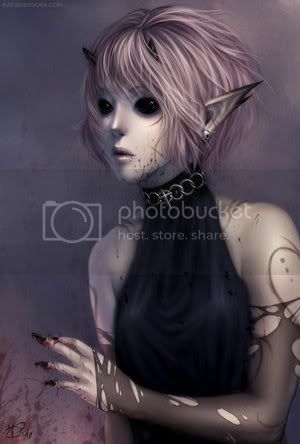 Ashley under the mask has pitch black eyes that dont let any light escape long pointed ears and sharp black pointed fingers, her bland attitude seems truly cold when she stares you down and the palpable aura of magic around her is almost painful. The Area around Ashley is thrown in a sharp contrast that some consider brutal, fairest that stand to close look like hollow beauties no substance at all, Ogres look like brutes with no minds, Darklings like sad empty things, Elementals as drab things of no real form and no humanity, and wizened look truly shrunken and wasted. The air is always freezing causing ice flowers to bloom on glass and blood to freeze. Ashley is the youngest seasonal monarch in LA and is a fairly potent contract worker, some claim she is a witch in her own regard. the only issue that really causes tension though is her lack of caring for most of the freehold except the winter court. Ashley doesnt leave her apartment often and when she does it is a quick trip to the goblin market or one of the winter holdings. Generally runners of the winter court get everything for her, these kids change very night. Ashley doesnt express a negative or positive opinion of anyone, even her most fervent followers. Her crown is thought to be a truly unique example as it grows directly from her skull, a circle of horn like protrusions made out of ice and her own blood. It pushing right out of her skin in what must be extremly painful. She says it gets mildly itchy.